Aqui no hay tiempo, soy nada mas. Soema Montenegro is an experimental folk musician from Buenos Aires, Argentina who began performing solo in 2008. Finger plucking a nylon stringed Spanish guitar while singing, her style is a soulfully enigmatic blend of free form jazz, Latin folk, opera, tango and flamenco. The addition of other-worldly percussion adds an element of dream pop to her eclectic sound, yet her compositions retain their bare, emotional feeling. After recording a video documentary of Montenegro, influential video blogger Vincent Moon championed her as being "the best singer in the world." With international interest, she released her sophomore album Passionaria in September 2011 on Western Vinyl Records. 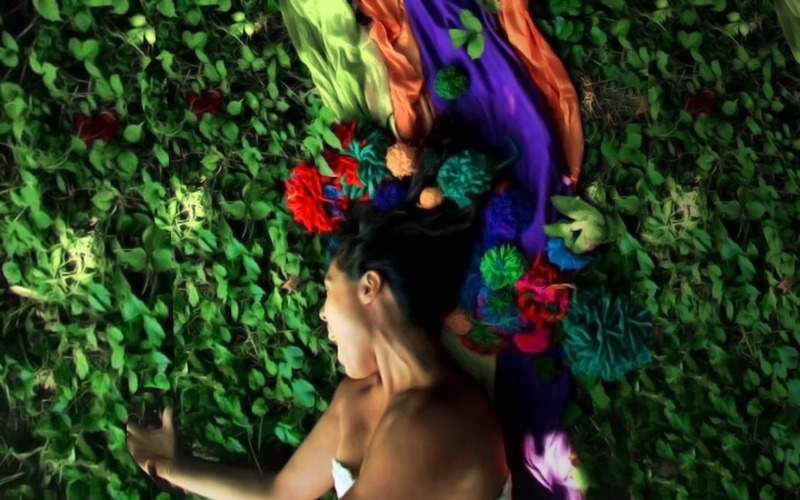 On the cover of Soema Montenegro's experimental folk album Passionaria, she is surrounded by colorful flowers, but even the vibrancy of these flowers is no match for her voice. She has the rare ability to go from melodically serene to intensely theatrical, all while maintaining absolute control of every fiber of her vocal chords. Her experimental stylings may not be for everyone, but her voice caught the attention of renowned indie filmmaker Vincent Moon, who called her the “best singer in the world” and featured her on the 100th episode of his “Take Away Show” music video blog. Although she sings completely in her native Spanish (she's from Buenos Aires, Argentina), Montenegro manages to transcend language barriers by using her unique vocal tones to express raw emotions. On “Cuando Pasa,” her voice comes in like a jungle cat on the prowl, over stark instrumentation. She sets a quietly dark mood, before urgently singing what translates as “sleep, child!” in Spanish—as if she's trying to calm down a child who just saw a monster in a closet. With a serenely plucked acoustic guitar opening, “Rio Arriba” (which translates as “upstream”) is more of a gentle lullaby. A string section trickles in like flowing water, and you can envision floating along without a care in the world, letting yourself get swept away in Montenegro's stunning voice. Besides the power of Montenegro's voice alone, the album stands out by drawing inspiration from a wide-range of Latin American musical folklore genres, from the pre-Tango Argentine milongas, to the rural Peruvian folk style called huaynos. The huaynos style of using flutes and pipes can be heard in Colibri, and suddenly it makes sense that Montenegro also has a background as a shaman. One of the most theatrical tracks on the album is “Flores Del Desierto.” Snare drums and gypsy-like horns come in like a freaky procession, with ghostly wails and shrieks enhancing the haunting atmosphere. That, combined with Montenegro's blood-curdling scream at the end, might make her music difficult to grasp onto, but her voice is powerful and interesting enough to keep you coming back for more.